In today’s episode of the Embracing Your Unlimited Possibilities Podcast, Inspirational Speaker, Spiritual Business Consultant, and Metaphysical Teacher, Carol A. Briney Talks About The Best Kind Of People In Your Life. To Listen To This Fun, Informative, and Thought Provoking Podcast Click on The Green Player Below. In today’s episode of the Embracing Your Unlimited Possibilities Podcast, Inspirational Speaker, Spiritual Business Consultant, and Metaphysical Teacher, Carol A. Briney Talks About The Law of Attraction and Why You MUST Own What You Want To See In This World. To Listen To This Fun, Informative, and Thought Provoking 15-minute Podcast Click On The Green Player Below. 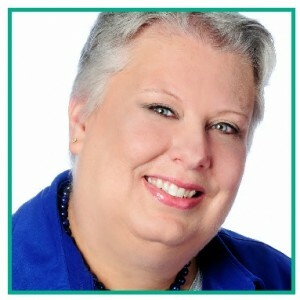 In today’s episode of the Embracing Your Unlimited Possibilities Podcast, Inspirational Speaker, Spiritual Business Consultant, and Teacher, Carol A. Briney Dares You To Choose Happiness and Joy In Your Life. Listen To This Fun, Informative, and Thought Provoking 14-minute Podcast Click On The Green Player Below. In today’s episode of the Embracing Your Unlimited Possibilities Podcast, Inspirational Speaker, Spiritual Business Consultant, and Author, Carol A. Briney asks the question “Are You Waiting For Someone Else To Change So That You Can Be Happy?”. In today’s episode of the Embracing Your Unlimited Possibilities Podcast, Carol A. Briney shares some quick, easy and practical tips on how to conquer the clutter in your home. 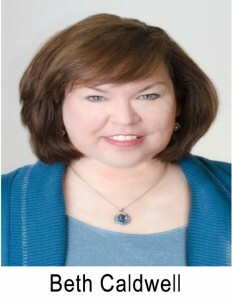 In today’s episode of the Embracing Your Unlimited Possibilities Podcast, Carol A. Briney interviews Beth Caldwell about her new book From Frantic To Focused. Listen and learn why this book is a must to read if you are interested in growing your business and enjoying your life. Click on the green player below to hear this powerful 40-minute podcast! 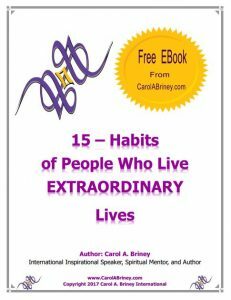 To Receive Your FREE Ebook Titled 15 Habits of People Who Live Extraordinary Lives Sign Up For Our Newsletter Full Of Information on Transforming Your Life From Ordinary To Extraordinary. The cost of the newsletter and Ebook is free. The benefits to you are priceless! 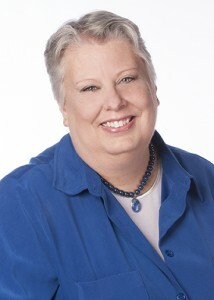 Is Your Personal Story Holding You Back? In today’s episode of the Embracing Your Unlimited Possibilities Podcast, Inspirational Speaker Carol A. Briney explains why your personal story might be holding you back from living your dreams and what you can do to change if you are motivated to do so. Please take a minute to rate and review this podcast. Your reviews and ratings help us to grow! The Best Gift That You Can Give To Humanity. In today’s episode of the Embracing Your Unlimited Possibilities Podcast; Inspirational Speaker, Author, and Mentor, Carol A. Briney speaks about the Best Gift That You Can Give To Humanity, how you can give it, and why it is so important to give. Are you a people pleaser? Do you always put other people’s needs before your own? Does your happiness depend on other people’s happiness? If you answer yes to any of these questions be sure to listen to this important, life-affirming podcast. Click on the green player below to listen to this short but extremely important podcast.